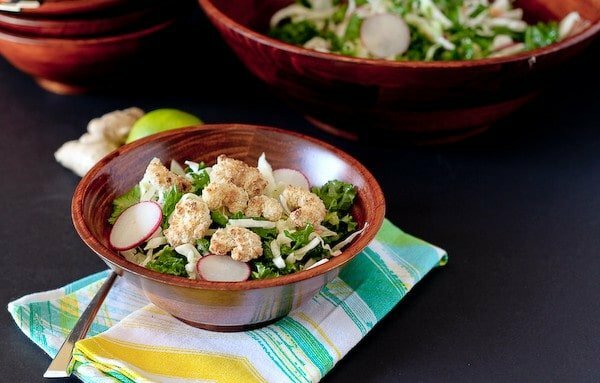 This crunchy kale salad recipe is light and refreshing, crispy and fresh. Topped with popcorn shrimp, it’s the perfect summer meal. Summer time. 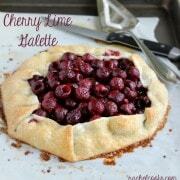 The perfect time for easy, refreshing meals. Hot weather — calls for cool food. Bathing suits. Ugh. I don’t even want to talk about that. We all know what bathing suits mean. Bathing suits mean salads, and lots of them. Gorgeous sunny days. Those mean you don’t want to spend the whole day slaving away in the kitchen. Also, I feel like I’m committing some kind of mom-crime if I don’t have the kids outside as much as possible and for as long as possible every day. It is such a shame to be inside with the sun is shining and there is an opportunity to enjoy that. We’re in a second story condo so we don’t have a formal yard but we make the most of the space we have. Lots of long walks, lots of sidewalk chalk, lots of parks. I’m almost glad we don’t have a yard right now because it forces me to really spend the time with my kids. I know that sounds horrible, but when you’re with them day in and day out, it’s nice to have a push to play with your kids with no distractions. I can’t sit on my deck and work on my laptop while the kids play in the yard. I’m there playing with them and interacting…you know, making sure they don’t run out into the street. So all that leaves less time for making dinner. That’s where quick and easy meals like this one come in. Meanwhile we are putting in offers on houses with fabbbbbbulous yards. But that doesn’t mean I can’t be happy where I am in the meantime! 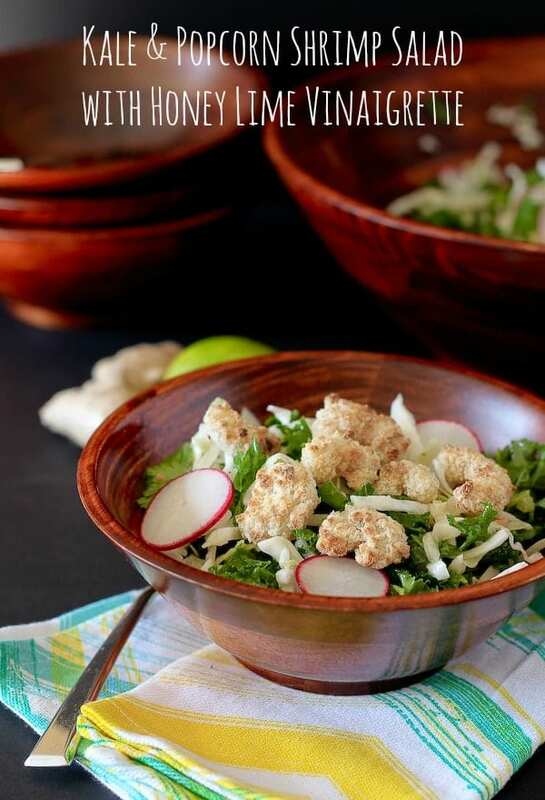 This salad quickly became a favorite of ours. Full of crunch and freshness. I also added plenty of kale to up the nutritional factor of this salad. 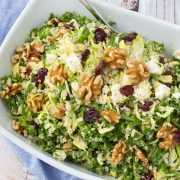 If you typically scoff at kale salads (my husband can’t really handle the amount of kale in pure kale salads), this is the kale salad recipe for you. Thinned out with cabbage, carrots, and cilantro, it’s the perfect blend for any palate. I dressed it with a light and refreshing dressing made with fresh lime juice, honey, light olive oil and fresh ginger. 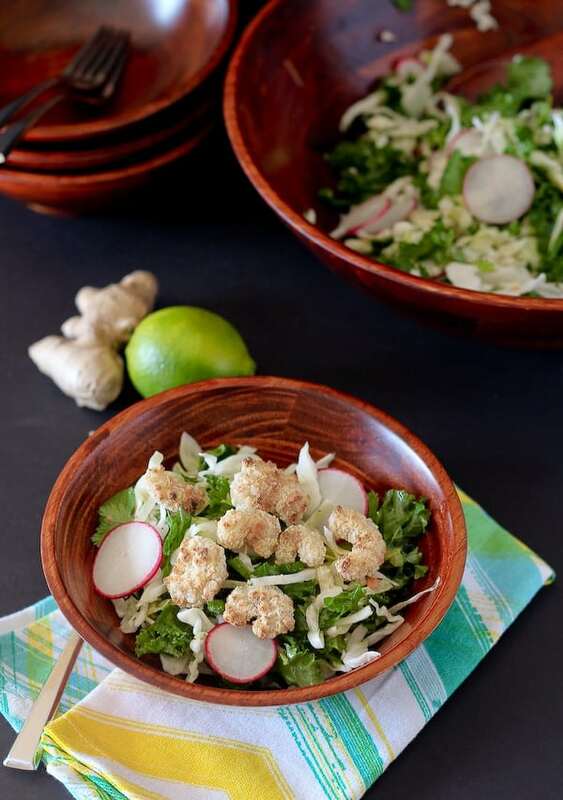 I teamed up with SeaPak Shrimp & Seafood Co. to bring you this kale salad recipe to help you #CoastIntoSummer. I love that you can bake this shrimp for a healthier preparation or you can fry it up for a more traditional take on it. Either way would be fantastic on top of this salad. 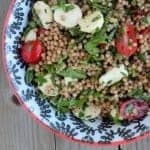 This is the perfect protein to throw on top of this kale salad because it is super easy to grab out of the freezer and cook. And it goes great with the fresh flavors of this salad. In a large bowl, whisk together dressing ingredients with a whisk or fork. Taste and season with salt and pepper. 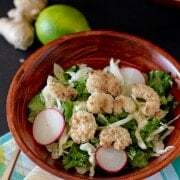 Add kale, coleslaw mix, sliced radishes, cilantro leaves and toss until all ingredients are coated with dressing. Cook shrimp according to package directions as desired (I chose to bake mine). Top salad with popcorn shrimp immediately prior to serving. SeaPak is also giving you a chance to win a $300 gift card — make sure to enter below! Good luck! Disclosure: SeaPak compensated me for my time to create this recipe. All opinions are my own, as always. So funny I was just telling someone I was craving shrimp!!! You read my mind! What a beautiful looking salad, sounds delicious! You are going to laugh at this: I read the title that this was a salad with shrimp AND popcorn. I just couldn’t wrap my mind around what it could be. Needless to say I had to laugh at myself. This looks fantastic, Rachel! Pinned! 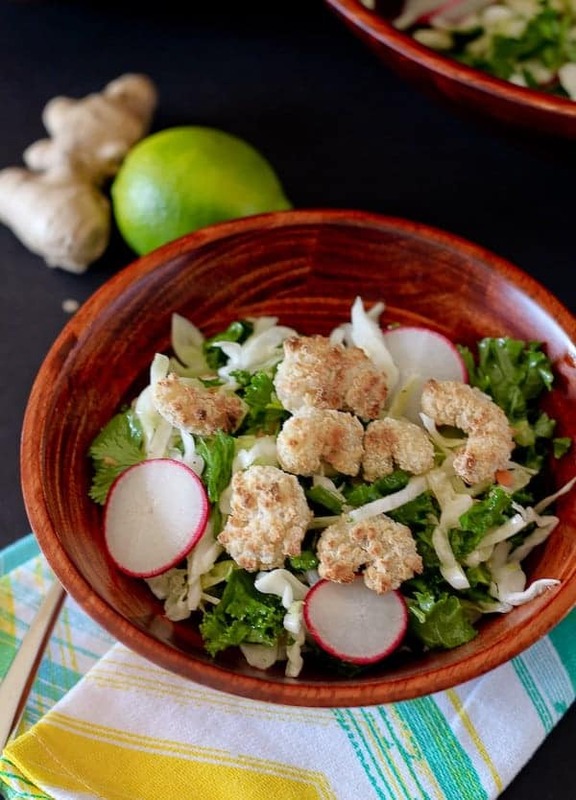 The husband HATES kale…but I’m thinking these popcorn shrimp might do the trick. Whatcha think? So, we have a yard, and sometime I find myself glad that Logan will play outside so that I can get things done in the house. Then after a few minutes I start feeling guilty that I’m not playing with him. But now it’s also almost 100 degrees out everyday and playing outside all day is just impossible. So I kind of have the opposite problem LOL. Still putting offers in on houses? UGH! I don’t have kiddos to watch, but I still love a quick and easy dinner…especially a healthy one that involves Kale, Salads and Popcorn shrimp! <3. Pinned! I understand exactly what you mean about being able to interact with your kids without distractions. Especially in this digital age, and with “multi-tasking” being something to aim for, we often aren’t totally focused on the people around us. This salad sounds great… I especially like the combination of ingredients in the dressing.